The above entry from Wiki says a lot about her claim to fame but does not tell anything like the full story of Dale Greig’s remarkable career. Track Champion,. Cross Country champion and international athlete for 13 years, marathon pioneer and world record holder, ultra marathon runner and more covers the bases and we need to look at what she did before the remarkable run in Ryde. Doug Gillon listed some of her career highlights in an article in ‘The Herald’ in April 1998 as follows. It is clear that we are not talking about a plodder who was lucky one day – we are talking about a serious athlete who had a core of steel which enabled her to do remarkable things in the sport. If we take her career in order we might get some idea of what she had to do to become one of the top rated world athletes: was she not rated ahead of Ingrid Kristiansen, Wanda Panfil, Rosa Mota and others in an American poll of The Greatest Women Marathon Runners in history where she was ranked ninth with Catherine Ndereba first. Dale started off her career as a track runner in summer and cross country runner in winter. One of the interesting facts of her cross country career was the close rivalry at times with that other great marathon pioneer who came after Dale and who capitalised on what she did to such an extent that women’s marathon running in Britain was never the same again: Leslie Watson. If we look at their relative positions in the SWCCU Championships between 1964 and 1971 we get this picture. 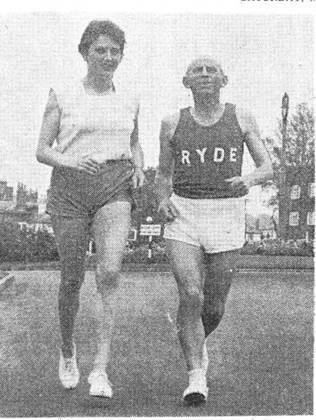 In 1966 she was ranked fifth in Scotland for the Mile which was the longest distance women could race at the time with 5:36.0 – Leslie was second with 5:14.4 – and in the SWAAA Mile championships she was third to Watson’s first place; in the West District championship, she was third while Watson was second. At this point she was of course thinking of the marathon. Her next appearance in the ranking lists is in 1969 when the 3000 metres was introduced to the championships and she was fourth with a time of 11:46.5 on the cinder track at Scotstoun. It is of more than passing interest to note that she was running for a club named Tannahill LAC. There had been no club for women in Paisley at the time and this was not unusual, for instance in Greenock there were two clubs for men (Greenock Glenpark and Greenock Well park) and the women had to form their own club, Greenock Rankin Park LAC. The difference was that Tannahill was a one member club – Dale was president, secretary and treasurer and sole running member! When one bears in mind that this meant that she had to pay all the affiliation fees (SWAAA, SWCCU, County, etc) out of her own pocket as well as all the incidental costs that clubs have to bear in order to survive. It was clear that she meant business. A better than average career but not enough for Dale. At a time when the longest distance that women could run on the track was one mile, she took on the challenge of running 26+ miles. Working as secretary in Walter Ross’s printing firm, she knew of the marathon at Ryde in the Isle of Wight. Walter’s brother lived in the Isle of Man so it was that she went to run in that one. She couldn’t run with the men, that was clear so she started four minutes ahead of the field. The first of the 67 men entered passed her soon after the start but she finished the course, the challenge was simply to last the distance. She finished in 3:27:45 – she insists that she was actually 20 seconds faster but the recognised time was published in ‘Athletics Weekly’ and although the magazine published a correction a few weeks later, it has been ignored and the 45 seconds remained. The report in ‘AW’ was fairly detailed as far as the men were concerned but at the bottom, after the results and separated from the report by a line, it said “Scottish girl Dale Greig, starting 4 minutes before the men, ran unofficially and completed the tough course in 3h 27m 45s.” The report in the local paper for Saturday, May 23rd, (from which the picture at the top is taken) read: “A slim 27-year-old Scots girl astounded the AAA officials when she completed the IW Marathon course on Saturday – the first woman to run this distance in Britain.. Dale Greig who at weekends turns out for her local club at Tannahill, Paisley,, came to the Island a week beforehand to train over the 26 miles 385 yards hilly course, one of the toughest in Europe. Three times winner of the Scottish women’s cross country championship, her aim was to better the unofficial women’s world record of 3 hrs 35 mins set up three months ago by an American girl over a flat course. Although Dale was prepared to run among the 67 men competing, the officials would have none of it since marathons are, or rather were, a strictly male domain. Instead they allowed her to leave four minutes ahead of the rest of the field, and had a quiet word with the course ambulance driver to keep an eye on her. The same officials broke into cheers when 3 hrs 27 mins 25 secs later, Dale stormed over the finishing line in a sprint with a better time than many of the men, 19 of whom failed to finish. She ran straight into the arms of her widowed mother, Mrs Ann Greig who followed the race for most of its distance in a car. “I knew she could do it,” said Mrs Greig. “Dale is a secretary for the editor of a Scots sports periodical and lives for athletics.” Dale’s employer, Mr Walter Ross, himself a competitor in past marathons, agreed. “She’s a bonnie lass,” he said admiringly. Commented Dale: “Before the race I was nervous, but once I started I knew things would be all right.” With a grin she added: “I felt sorry for the men I kept passing in the closing stages – they looked embarassed. A couple who had given up and were sitting at the roadside struggled to their feet when they saw me. Several things are clear: she suffered no harm, she enjoyed the race and it was at that time illegal in Britain. To make it worse, it was a mixed race and she had been helped for part of it by Walter’s brother Bill – some say that Walter himself helped out in this way too. 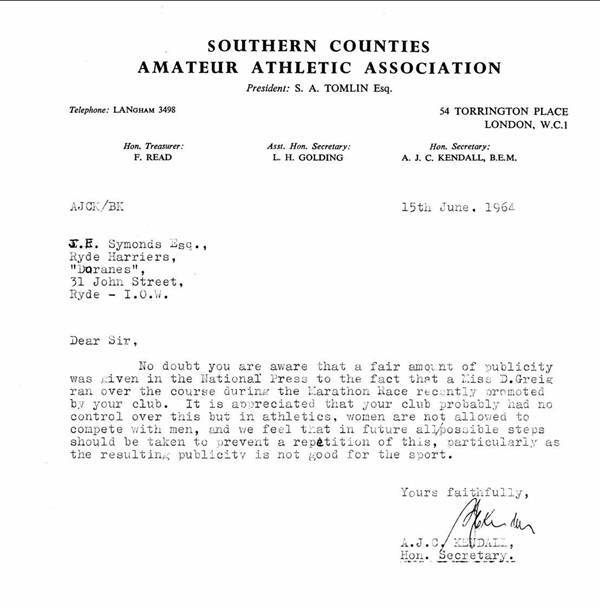 Officialdom was not happy and the following letter – reproduced in full – gives some of the flavour of their distaste. The furore blew over and Dale kept on running – having won the SWCCU title earlier in 1964 she continued to run and in 1965 was third. Her next big challenge was the Isle of Man 40 miles TT Course in 1971 – interestingly enough the report on the 1971 SWCCU Championship says that she ‘was satisfied with placing in the top dozen as she had her eye on a run in the Boston marathon’ That would have been interesting as it was before Kathy Switzer had her famous contretemps with Jock Semple! Also in 1971 she ran in the Ben Nevis race – Britain’s highest mountain at more than 4400 feet – which she said was a “body shattering” experience. Walter Ross was an enthusiastic veteran harrier and was responsible for starting up the Scottish Veteran Harriers Association. He was also very keen on the international side of the movement and when he managed to get the IGAL World Road Running Championships to Glasgow in 1980 there were hundreds of runners from all over the world running through the streets on the south side of Glasgow in the 10000 metres on the Saturday and the marathon on Sunday. It was a wonderful festival of running and comradeship with exquisite pieces of jewellery in lined boxes for every finisher. The first such championship was held in Paris in 1974: one Scottish runner ran with an armful of flowers which he distributed to spectators with the cry of “Vive l’Ecosse!” As in Brighton, the day belonged to the Scots when, in 80 degrees heat, Alastair Wood won the men’s race and Dale, aged 37, took the women’s event in 3:45:21. This was the first ever marathon in which men and women were allowed to run together. The Editor of the ‘France Soir’ newspaper presented Dale with a trophy which she keeps in a cupboard at home with her other memorabilia. Reports always comment on two things – the fact that she has no trophies, medals or certificates on display and the fact that she made no money from her career. Doug Gillon goes on at length about the houses owned by Paula Radcliffe, Liz McColgan, et al and makes the point that while they are millionaires, she lives in a small home bought from the Council. Her line is simple and has been reported frequently and it runs as follows – “I don’t envy them the money. I’m against materialism and glad to have missed the drugs which came into the sport after I had gone, but I envy them the opportunity that they have to make a career and a life out of running. I would have loved that!” The picture below is from an ‘Athletics Weekly’ article of 2002 by Doug Gillon and shows Dale with her friend Aileen Lusk running in the IGAL marathon. Dale has had a wonderful career and been a first class ambassador for Scotland as a whole not just the running community: would that we had some like her today!